The five-story production building, which the company calls Building O, was planned to support expansion. The 172,225-square-foot structure, designed by the Pritzker Prize-winning Japanese architect Shigeru Ban, combines watchmaking facilities previously housed in three buildings. And it’s big enough, Omega executives hope, for 30 to 50 more years of growth. With the official opening scheduled for November — two years later than originally planned because of architectural revisions — workmen in August were paving the parking lot, and the vacant reception area on the ground floor was awaiting finishing and furniture. The three-story “heart” of Omega’s new production facility houses 30,000 boxes of watch parts. Building O is not the only Swatch construction project on the outskirts of this Swiss watchmaking city. Adjacent is a new Swatch-Omega museum, now a skeleton of steel girders covered in plastic tarps and scaffolding, and just beyond is the construction site of a new Swatch headquarters. Both are scheduled to open in 2018. At the center of Building O is a giant glass-enclosed atrium three floors deep, an inventory area called “the heart,” with 30,000 stacked boxes of watch parts that are retrieved as needed by a roving automated arm. During the methodical assembly process, each watch is handled by as many as 20 technicians before receiving a final stamp of approval. For 20 percent of Omega timepieces, that approval is the Master Chronometer certificate provided by the Federal Institute of Metrology, or Metas), an independent Swiss government laboratory that operates on-site. Its workers test watches for water resistance, accurate timekeeping and magnetic resistance; by 2020, Omega said, most of its watches will be certified by Metas. Mr. Aeschlimann, the grandson of a Swiss watchmaker, was born in the nearby Vallée de St.-Imier. He worked at Longines and Complementa AG before joining Omega in 1996, and became vice president and international director of sales, retail and distribution in 2001. He moved into the top job last year when Stephen Urquhart retired. The executive’s elegant suit and easy conversation reflect his cosmopolitan background. He shifted quickly from French — what he called “the language of the watch industry” — into a mix of English and German. “I am the Swiss-French link,” he said, noting a quarter of his staff members speak Swiss German as a first language. On this particular day, he was wearing one of the 34 models of the upgraded Seamaster Aqua Terra line introduced in March. At 41 millimeters, the watch is a mix of stainless steel and gold, with a silvery dial, a black rubber strap and the company’s Co-Axial Master Chronometer Caliber 8900. And has been the biggest surprise of Mr. Aeschlimann’s 15-month tenure? 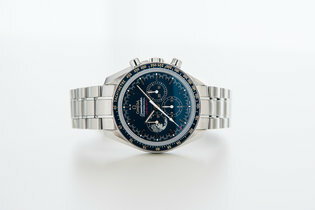 He said it was the overwhelming response to “Speedy Tuesday,” a limited edition of Omega’s iconic Speedmaster. In 2012, Robert-Jan Broer, founder and editor of the online magazine Fratello Watches, posted a picture of his Speedmaster on Facebook with the words “Speedy Tuesday” — and a weekly craze was born that eventually moved to Instagram and has elicited about 70,000 photographs from fans. Last fall, Mr. Broer and Mr. Aeschlimann began working on the idea of a limited-edition version of the watch to mark the event’s fifth anniversary. The Omega Speedmaster “Professional” Apollo has an engraved and etched image of the god Apollo and the moon, as well as the time of the last human step on the moon. When Omega introduced the timepiece on Jan. 10 on Instagram, all 2,012 pieces sold in about four and a half hours, and about 7,500 potential buyers joined a waiting list. “It shows how quickly a decision taken can bring success,” Mr. Aeschlimann said, adding that there are no plans to replicate the project but that Omega is exploring more online sales options. Mr. Aeschlimann also has been mining some of the brand’s hallmark connections. As for Omega’s sales targets, Mr. Aeschlimann said he wanted to bolster the brand’s profile among women. The house’s “Her Time” exhibition, a mix of women’s timepieces and advertising campaigns that has been shown from Milan to Shanghai, will be opening in Paris in late September, during fashion week. He said Omega had high hopes that women would embrace the Speedmaster 38 millimeter — its Cappuccino model is featured prominently in the current advertising campaigns and boutique windows. Despite his executive position, Mr. Aeschlimann still spends 30 percent of his time traveling — and he is adamant that Omega stores around the world will remain the company’s backbone. “We could close every boutique and only sell on the internet with e-commerce, but we haven’t even thought of it,” he said, stressing that the store experience is essential to the company’s long-term success in sales. A case in point: The boutique on Zurich’s famed Bahnhofstrasse is among the brand’s busiest and most successful shops. This summer, it included a flashy Speedmaster Moonwatch exhibition, an event marking the 60th anniversary of the first Speedmaster model as well as its historic 1969 turn as the first watch worn on the moon. As visitors examined the mannequin in an astronaut’s suit at the door and a variety of watches on display, the service staff on the boutique’s main floor not only repaired watches but also told stories to prospective buyers — about Omega on the moon, in the Bond films, at the Olympics. What Are The Best Air Purifiers For A Modern Lifestyle?